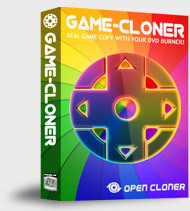 Game-Cloner 2 is the smart game copy software to copy PS3 games, PS2 games, Xbox 360 games, Wii games and PC games. Besides the game disc copy, it can also make ISO files and copy the ISO file from the hard disk to a blank disc. Game-Cloner 2 can also recognize the .dvd files on the hard disk under the Xbox 360 copy mode. Moreover, you can set up some options to optimize your game copy such as setting the burn speed and the type of "Burn I/O", etc. Game-Cloner 2 enables you to play various games, CD games, DVD games or Blu-ray games, whatever they are! If you're not happy with your purchase, anytime within 30 days, your purchase will be immediately refunded.